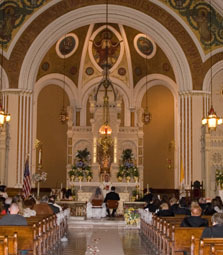 Wedding guidelines vary from culture to culture and generation to generation. What might have been appropriate 20 years ago may be frowned upon today. Some rules are more firm than others and brides wishing to follow proper etiquette can find appropriate thoughts of action here. There are many variations for the wedding procession, listed below is a typical format to follow. The officiant, groom and best man stand at the altar. The grandparents are escorted down the aisle followed by the parents of the groom and then the bride's mother. The maid of honor and/or matron of honor follow. The flower girl and ring bearer walk ahead of the bride. I've been to weddings where the flower girl and ring bearer are very young and a bit shy, so the bride had them walk ahead of the maid of honor. 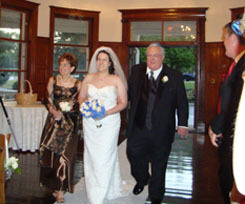 The bride is escorted and walks down the aisle to the left of her father, brother, uncle or other special male if her father is not able to walk her down the aisle. If the bride has a very long train and veil she may walk to the right of her father to avoid him having to step over her train and veil after he escorts her to her groom. If for some reason you are late to the ceremony, please remain in the back and wait for the procession to finish before you quietly slip into a seat. 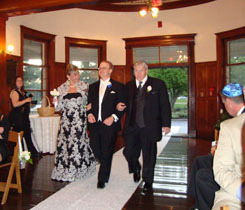 In a Jewish ceremony the groom is escorted by his parents followed by the bride and her parents. Here's a thought for correct wedding ceremony etiquette. Should a step parent be part of the wedding ceremony procession? Well, that depends upon the relationship with the bride and groom. If the step parent has been an active part of the bride or groom's life, then by all means include them in the procession. If not, the step parent may choose to take a seat while the other guests are being seated. 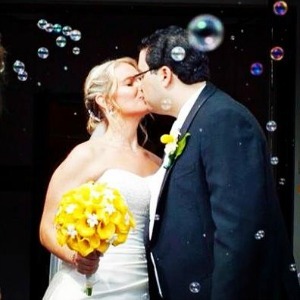 Who helps with the bride's veil, train and bouquet for proper Wedding Ceremony Etiquette? The maid of honor helps the bride put the veil over her face before she walks down the aisle. The bride's father picks up the bride's veil and gives her a kiss before he escorts her to her awaiting groom. The maid of honor fixes the veil so that it is in place and looks good. The maid of honor also carries the train when appropriate. The bride hands the bouquet to her maid of honor as she and her hubby walk up to the altar. 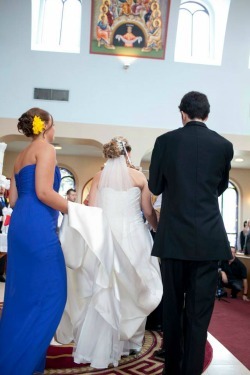 After the ceremony is complete proper etiquette dictates that the recessional begins with the bride and groom walking down the aisle followed by the bridal party, bride's parents, groom's parents, grandparents, special guests and then the remaining guests follow row by row. Proper wedding ceremony etiquette for the receiving line? The bride and groom and their parents. The bridal party usually waits in the vestibule. The remaining guests wait outside for the bride and groom. Once the bridal couple's receiving line is complete, the bride and groom along with their attendants line up outside the ceremony place for group pictures. Wedding ceremony etiquette is not an exact science. If you have any questions please contact me and I will gladly help you find an appropriate answer to your query. Tap here for good ideas and easy reading to plan your perfect wedding day.